Published: May 1, 2015 at 11:21 p.m. 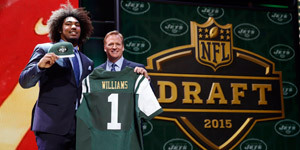 Updated: May 2, 2015 at 12:28 a.m.
CHICAGO -- The second day of the 2015 NFL Draft did its best to offer as much drama as the first, and the biggest stunner was a fall for one of the draft's elite talents. Here are eight surprises from Friday's second- and third-round action. 1. Tumble finally ends. Perhaps the top pass rusher in the draft, Nebraska's Randy Gregory, tumbled all the way to No. 60 overall, where the Dallas Cowboys ended his slide. It was certainly no surprise that he slipped after a failed drug test at the NFL Scouting Combine, but this wasn't a slip -- this was a free fall. And leave it to Jerry Jones to catch him. Gregory admitted Friday morning that he expected to be picked in the first round despite the concerns over his drug use, which also included at least two failed tests at Nebraska. Still, few expected him to come within three picks of falling to Round 3. 2. Clemmings still waiting. Pittsburgh offensive lineman T.J. Clemmings goes into the third day of the draft still waiting to hear his name called. For a player who was projected to be among a group of offensive tackle prospects snatched up near the end of the first round, that's a stunner. NFL Media analyst Mike Mayock said concerns over Clemmings' medical file have caused the fall. A stress fracture in Clemmings' foot was reported last week. It will be another surprise if Clemmings lasts long on Saturday. 3. Off board for some, Day 2 pick for Seahawks. Here's another surprise from the questionable character department, but in this case, unlike Gregory's, a player went earlier than expected. The Seattle Seahawks took Michigan defensive end Frank Clark with the No. 63 overall pick in the second round despite significant character concerns. Said NFL Media analyst Daniel Jeremiah: "Several teams took him completely off their board." The Seahawks not only had him on their board, they had him awfully high. 4. Early trigger. Cornerback Senquez Golson going to the Pittsburgh Steelers at No. 56 overall was unexpected. At 5-foot-8, Golson is likely headed to a nickelback role and has all the quickness needed to excel at it, but the likelihood that he'd have been available to Pittsburgh with its third-rounder (No. 87) seems pretty high. 5. Going big. Although it's no surprise that the Carolina Panthers picked a wide receiver, another redwood tree to go with Kelvin Benjamin (Michigan's 6-foot-5 Devin Funchess) wasn't exactly the style complement that would have been expected. A speedier, quicker option might have been a better fit. Unless, of course, the Panthers have designs on making Funchess into a flex tight end. 6. Harold goes late. Virginia linebacker Eli Harold was drafted No. 79 overall after some pre-draft projections had him cracking Round 1. The pass rusher went to the San Francisco 49ers and could be an exceptional value if he develops into a productive presence on the edge. 7. Strong value. Anyone out there see Arizona State wide receiver Jaelen Strong, a first-round projection by some, hanging around until the third round? Didn't think so. You can bet the Houston Texans were surprised, too, to land him at No. 70 overall. 8. Jumping ahead. Linebacker Benardrick McKinney wasn't the first player drafted from his own college. A surprise to almost everyone.